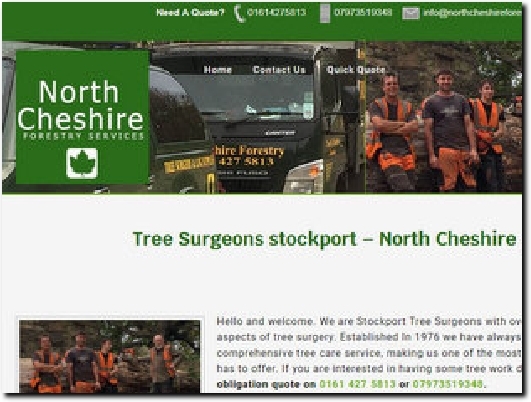 EST 1976 North Cheshire Forestry are Stockport tree surgeons with an excellent reputation for quality tree surgery. With fully insured and NPTC trained staff we undertake all aspects of tree and hedge work. Stockport-based tree surgeons providing a wide range of services to South Manchester and parts of Derbyshire and Cheshire. With over 40 years experience, the company is fully insured and uses fully trained staff working to current industry best practices to comply with BS3998. Contact Us has the business address, phone and e-mail details and a contact form.